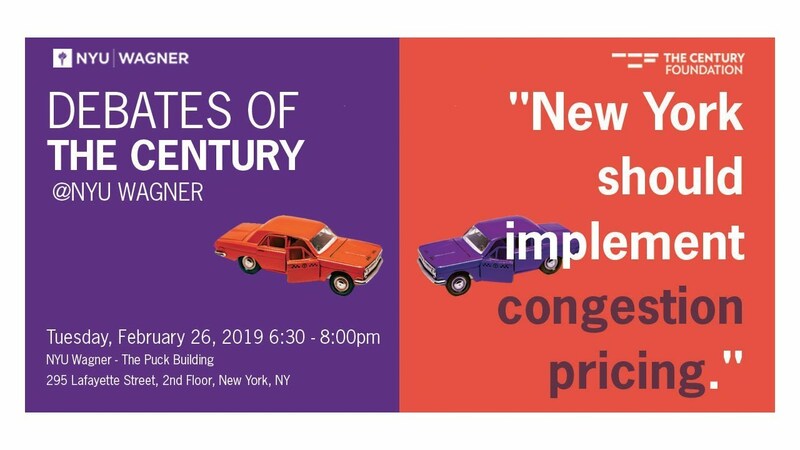 Join The Century Foundation (TCF) and NYU Wagner on February 26, from 6:30–8:00 pm, for a debate on whether New York City should implement congestion pricing to tackle the mounting challenges facing its residents. Can the policy generate the revenue forecasted and simultaneously improve our city’s streets, environment, and economy? Or is congestion pricing not as perfect as it seems, with its impacts unfairly burdening low-income, outer borough residents, and small businesses? This event, part of TCF and NYU Wagner’s Debates of the Century series, will feature Nicole Gelinas, senior fellow on urban economics and finance at the Manhattan Institute, arguing for congestion pricing, and Richard Brodsky, former assembly member and NYU Wagner adjunct faculty, arguing against the motion. Polly Trottenberg, commissioner of the New York City Department of Transportation, will moderate the debate. Appointed by Mayor Bill de Blasio in January 2014, Commissioner Polly Trottenberg leads the nation’s largest municipal transportation agency — with over 5,000 employees and a $17 billion 10-year capital plan. As Commissioner, Trottenberg directs the agency’s mission — focusing on mobility, safety, equity, sustainability and economic growth in DOT’s oversight of roads, bridges, bicycle and pedestrian infrastructure and the Staten Island Ferry. Under her leadership, DOT has expanded street resurfacing and reconstruction, increased bridge rehabilitation and construction, improved bus performance, and expanded the bike network to over 1,240 miles. traffic fatalities. Commissioner Trottenberg serves on the Board of the Metropolitan Transportation Authority (MTA) and chairs TRANSCOM. With more than 25 years of career public service, Commissioner Trottenberg most recently served as USDOT’s Under Secretary of Transportation for Policy, under the Obama Administration. She also worked under U.S. Senators Charles Schumer, Daniel Patrick Moynihan and Barbara Boxer. Trottenberg graduated from Barnard College and received her Masters in Public Policy from Harvard University’s Kennedy School of Government. Nicole Gelinas is a senior fellow at the Manhattan Institute, a contributing editor of City Journal, and a columnist at the New York Post. She writes on urban economics and finance. Gelinas is a Chartered Financial Analyst program charterholder and the author of After the Fall: Saving Capitalism from Wall Street—and Washington (2011). Gelinas has published analysis and opinion pieces in the New York Times, Wall Street Journal, Los Angeles Times, and other publications. Before coming to City Journal, she was a business journalist for Thomson Financial, where she covered the international syndicated-loan and private-debt markets. Gelinas holds a BA in english literature from Tulane University. Richard Brodsky has served in the New York State Assembly for 28 years. Richard served as Chairman of the Committee on Oversight, Analysis and Investigation, where he began his long-term effort to revitalize legislative oversight. In 2002, Richard was appointed Chairman of the Committee on Corporations, Authorities, and Commissions. He also served as a chief investigator, rooting out corruption at all levels of government. In 1993, Richard was named Chairman of the Committee on Environmental Conservation, authoring the most dramatic advances in environmental law in decades. He has also served as Chair of the National Caucus of Environmental Legislators, bringing together environmentally progressive legislators to coordinate their efforts. Richard has co-authored New York State’s School Tax Relief (STAR) program, saving homeowners and senior citizens thousands of dollars each year. He also led the fight against Mayor Bloomberg’s congestion pricing plan because it unfairly targeted low and moderate-income people, especially those living in the Bronx, Queens, Brooklyn and Staten Island. Richard has received the Rockefeller College of Public Affairs Distinguished Public Service Award, the Martin Luther King, Jr. Award, the United Federation of Teachers Friend of Education Award, the International Association of Firefighters Achievement Award, the New York State Audubon Society William B. Hoyt Environmental Award, and the Adirondack Council Conservationist of the Year Award along with many others. Richard is a graduate of Ardsley High School, Brandeis University and Harvard Law School. He is now in the private practice of law and serves as an adjunct faculty at NYU Wagner.